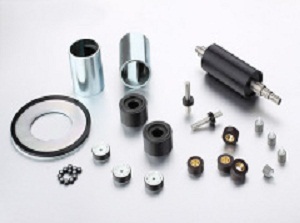 Bonded magnets was born about in the 1970 s, at that time the SmCo is almost commercialized. The sintered magnets have a perfect situation in market at that time, however, the sintered magnets is very difficult in manufacturing into special shape of magnets. What is more, the sintered magnets are easy to be crazed, damaged when manufacturing, difficult to assemble into machine. So the sintered magnets are limited in some field. In order to deal with this problem, the people broken the permanent magnets to pieces, mix in plastic products ,pressure molding In magnetic field. Which is the most original process of manufacturing bonded NdFeB. The bonded NdFeB is low in cost, accurate in size, untrammeled in shape,so then bonded NdFeB is popular in most field. From the found of bonded NdFeB in the world,which is power in magnetic force. The bonded NdFeB has a prompt development.